Is Jet an Amazon Killer? Now, I simply can’t do without online shopping… day or night. I’ve long ago applied those former brick and mortar shopping hours to other aspects of my busy life. So yes, Amazon has firmly become my go-to online shopping site for quite some time now. There’s always a huge selection. Amazon Prime’s free shipping seems like such a deal even at $99/year. And Amazon’s pricing usually beats the pants off of brick and mortar stores. But even without all of the bad press Jeff Bezos has received, I’ve grown a tad uncomfortable with the idea of shopping at only one URL. When my son was still in diapers, I frequented Diapers.com and eventually dropped some coin on its affiliated websites- Wag.com, Soap.com and Yoyo.com. The pricing was sometimes competitive, but the free shipping (if you spent more than $49) always seemed to beat out Amazon’s 2-day Prime delivery. …I’ve been hitting up Amazon. And while the convenience can’t be beat, I really don’t know how good the deals are anymore. I think it would be nice (and appropriate) if Amazon had a little competition… right? Well, guess what?…. Hello, Jet.com! Jet launched a couple months back, and it’s clearly looking to undercut Amazon’s pricing. The more you spend, the greater the discount. If you waive your right to a free return, you get a little more off. 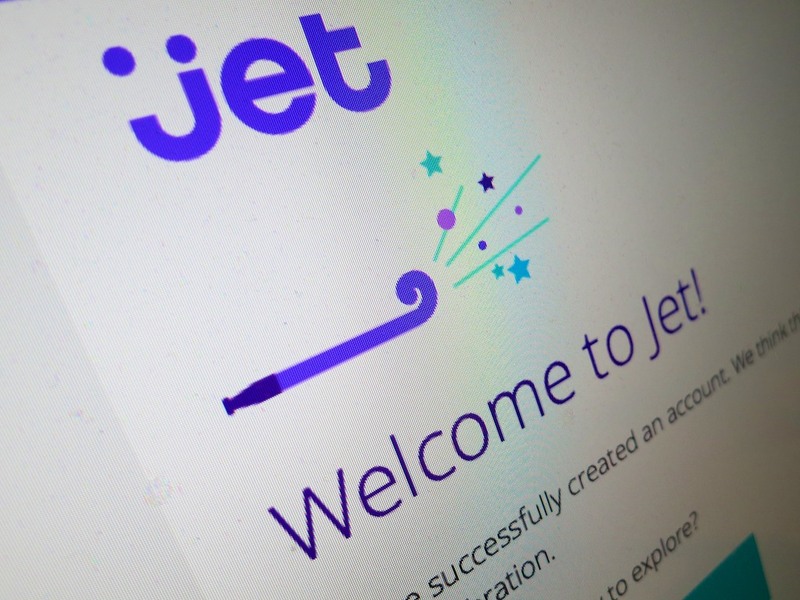 Jet claims its profit model is focused entirely on its membership club fee, which allows it to sell items at the lowest prices. First off, it’s base pricing usually just seemed to match Amazon’s. Sometimes the pricing hovered a few cents either way. Jet gives you an Amazon comparison tool right there on the page. But then, Jet applies an immediate discount, which grows if you order multiples of the same item. And as you put more things in your cart, your overall discount keeps growing. When you’re ready to check out, there’s indeed a significant savings. On my first order I saved $17.54 off the $72.54 subtotal. Plus free shipping. And no tax. I don’t pretend to understand how all the discounting is applied. But at the end of the day, it’s less than shopping on Amazon. And Jet even has a guarantee that if you don’t save at least $49.99 with your membership, they’ll refund the difference. Just like Amazon, Jet sometimes finds your item through another retailer. Jet doesn’t have (yet) the same massive selection as Amazon. I couldn’t find everything I wanted… No bags of Caribou Coffee… and Ziploc sandwich bags only in quantities of 500. Every order doesn’t get to you in two days. Sometimes the free shipping takes 2-5 days. Is Jet an Amazon killer? No, not really. But I can’t tell you how happy I am that finally there’s some good, old-fashioned competition to Amazon out there. And it doesn’t hurt that Jet gives you $10 off your first order (over $35) with a ‘TENBUCKSNOW” discount code. So all this said, will I still continue to use Amazon? Am I rooting for the little guy? Can Jet beat Amazon at its own game?